The above is what happens!!!! 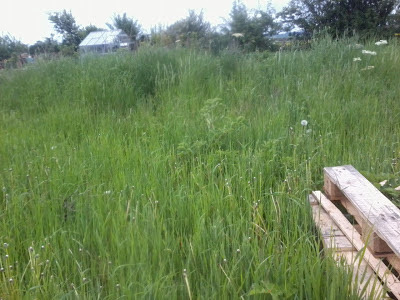 OK...so it was left alone for more like 5 weeks rather than 5 minutes but you get the idea, After just a few short weeks the bee plot resembles an abandoned paddock with grass 4 foot tall. Not only did this run away form me in all my "busy-ness" but my blog too. It's not that I have nothing to write but for a week or so I was just so incredibly busy that I didn't get to post and then every time I thought about posting I was so overwhelmed with how much i had to say it was daunting. Well today I came to a decision...little and often!! So over the next week or two I will be catching you all up on what's been going on with lots of smaller posts on a specific topic on a daily basis...I feel this is the only way I am going to get back on track. At this point I would just like to thank you all for bearing with me and coming back to visit after I have been silent for so long. Lots of pictures and posts to follow!! I look forward to hearing all your news. Thanks Jo, glad you're still with me!! If I thought the fence would keep them in I would certainly consider enlisting their help! I tend to go for shorter specific themes too - I have to say I run out of stean reading long posts and tend to skim over the later bits. I will be catching up with everyone too over the week so keep an eye out for me visiting Ann. Whoops! Happens so fast, especially at this time of year. Looking forward to hearing what you've been up to, in whatsoever format you choose to divulge!